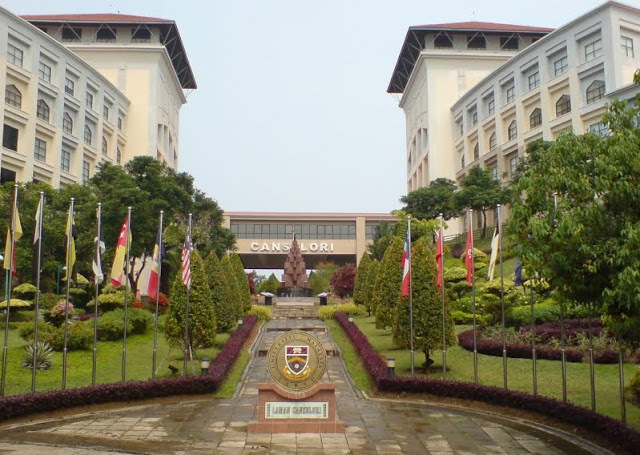 KOTA KINABALU: Universiti Malaysia Sabah (UMS) aims to be the first eco-friendly university in the country. It has set 2017 to be a fully “Eco Campus” after launching its EcoCampus blueprint yesterday. “It will be the first university in Malaysia to endeavour in the project based on three basic principles of innovation, relevant and sustainability in line with the global shout ‘The Future We Want’ at the recent Rio+20 global conference,” its vice chancellor Prof Datuk Dr Mohd Harun Abdullah said yesterday. He said UMS is committed to implement the elements contained in the Ecocampus blueprint to achieve the target to become a leading higher learning institution (IPT) model in preserving the environment. Blessed with abundant of flora and fauna, UMS is currently in the phase of being a reference center that acts as the guardian of the environment as well as to contribute to global efforts towards environmental excellence, research, management and operations in the future, he said in his speech at the launching of the blueprint at UMS ODEC beach, yesterday. He said the programme would increase the awareness amongst the global community towards sustainable development. With more than 17,000 students and 2,000 staff, he believed that this action would give a great positive impact towards the environment, economy and social in the region. He added that EcoCampus enables universities to systematically identify, evaluate, manage and improve their environmental performance and practices. Moreover, the programme would also benchmark environmental improvement by external audit whether an institution has attained a certain level of environmental performance. Prof Harun also pointed out five elements in the Ecocampus blueprint consists of sustainable development, ecology protection, environmental compatibility, resource conservation and environmental monitoring. “This programme is not just about promoting awareness to preserve our nature or encourage cleanliness, but it is about how we minimise the pollution and promote our nature tourism. “We want to capitalise these assets that we have around us, all the land, trees, sea and river,” he said. Meanwhile, Director General of Higher Education Ministry, Professor Datuk Dr Rujhan Mustafa praised UMS for their effort in improving their environmental performance through the blueprint. Apart from supporting the ecocampus programme, he also urged UMS and other IPTs to practice other concept of sustainability such as energy conservation (eco-energy), eco-space, eco-building and reduce the usage of plastic bag. He also touched on the importance of auditing in order to promote commitment to continual improvement in environmental performance. On the other hand, Minister of Higher Education, Datuk Seri Mohamed Khaled Nordin said that the increased population from 3 billion in 1950s to 7 billion in 2013 shows s that the world is increasingly dense and the activities also become more complex. The speech was read by Dr Rujhan. He said, the world is facing very serious issues such as species’ extinction, land degradation, pollutions and most of the events are caused by humans. He also added that the higher learning institutions are not only acts as a knowledge centre for the society but also as a medium to promote environmental awareness and address the solutions for these problems. Also present were DBKK Director General Joannes Solidau, UMS Chairman of Board of Directors Tan Sri Datuk Abdul Hamid Egoh, Assistant Minister of Resource Development and Information Technology Datuk Hajah Jainab Ahmad Ayid and UMS Registrar Datuk Abdullah Hj Mohd Said.